Most research on the creative process of Anton Webern’s music has focused on the sketches, thus emphasizing the compositional process in the narrower sense. Less attention has been paid to the fact that especially for most of the works composed between 1908 and 1915 (esp. opp. 3–12) there exists a number of versions (appearing as fair copies rather than sketches) that may show traces of a feedback coming from rehearsals or performances which have occurred before the first printing of the compositions. (A remarkable exception is of course Felix Meyer / Anne Shreffler: “Performance and Revision: the Early History of Webern’s Four Pieces for Violin and Piano, Op. 7”, in: Webern Studies, ed. Kathryn Bailey, Cambridge: Cambridge University Press, 1996, pp. 135–69.) But even in the case of later works (esp. opp. 27, 28, 30) annotations may be found in the sketches or other sources that hint at a relation to possible (future) performances. – How do we distinguish the (various) layers of ‘pure’ compositional revisions from the inscriptions that were undertaken during rehearsals? And if we can: How do we evaluate the two sorts of revisions within the context of textual criticism? – How do we (on the basis of possible answers to the first question) distinguish between different versions? In other words, which inscriptions are merely variants inherent to a particular version and which constitute different versions? – To what extent can the thus defined (different) versions (and/or variants) be edited and/or performed differently, i. e. without mixing the different versions (and/or variants) which might result in a new yet possibly never intended, at least from the composer perspective, text and/or performance? – To what extent is it possible to reconstruct particular performances of the music with the help of these traces of past rehearsals present in the sources? – Do performances ‘create’ new texts of a work if they differ from the written texts they refer to? The aim of this paper is to suggest possible answers to these and similar questions relying on the concept of a ‘virtual text’, a concept which refers to the notion of ‘virtuality’ as discussed by Gilles Deleuze [see esp. his Différence et répétition, Presses Universitaires de France, Paris, 1968] and other philosophers. This notion of a ‘virtual text’ will be developed in the paper and should be open to discussion. Moreover, a critical discussion of the concept of ‘the performative’ (as proposed by Erika Fischer-Lichte [see her Ästhetik des Performativen, Frankfurt am Main: Suhrkamp, 2004] and others) might contribute to a better understanding of the possible and complex relationships between musical texts and performances: aspects of performatives can be observed in both, texts and performances. The suggested methodology is both philological and analytical, thereby implying that the objects of research are ‘texts’ (both written and audio) that have to be constituted from a critical comparison of the differences they have to other texts. The goal is to demonstrate some kind of coherent connection of the observed differences (that is to say: ‘sense’, or significance). 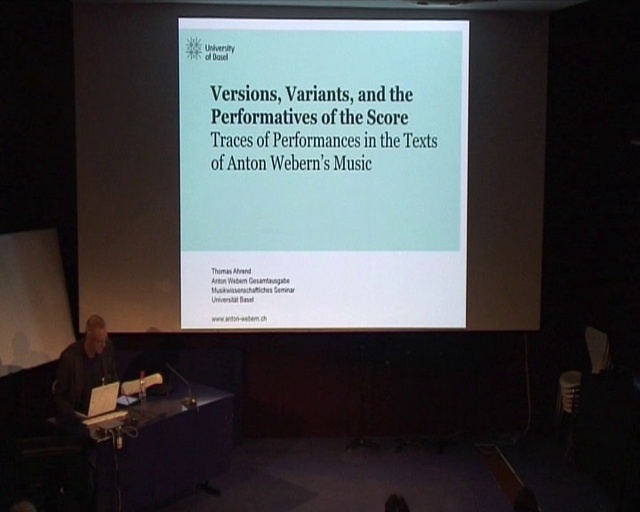 The written texts to be investigated contain all the known Webern sources (manuscripts and prints) – collected as digital copies at the Anton Webern Complete Edition in Basel, with further examination of some originals (of which the major part is held at the Paul Sacher Foundation in Basel). The audio texts to be explored are selected recordings both commercially available and especially produced for the present research project (in cooperation with musicians from Basel Academy of Music / School of Music).